David Williams II, Vanderbilt's vice chancellor and athletic director at the time, talks about improvements being made to athletic facilities at the Nashville university in June 2012. Williams died Friday at age 71, days after he stepped down and hours before his retirement party. 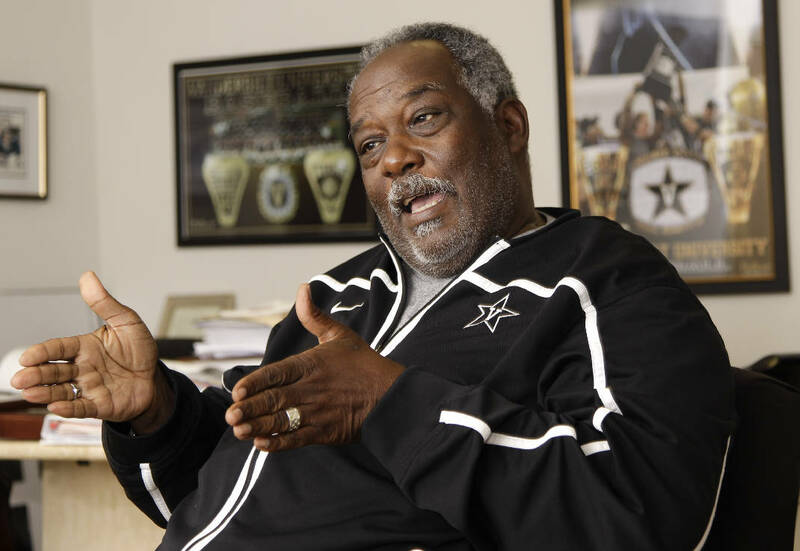 NASHVILLE — David Williams II, the first black athletic director in the Southeastern Conference and an "incomparable leader" at Vanderbilt, died Friday, hours before his retirement party. He was 71. "David Williams stood tall on this campus, in this city and in college athletics nationally as an incomparable leader, role model and dear friend to me and so many others," school chancellor Nicholas Zeppos said in a news release. "We are devastated by this loss. His impact on our community is immeasurable and will be felt for generations to come." Williams was nicknamed the Goldfather — the school colors are black and gold — for his success at the school. He had been the SEC's second-longest tenured athletic director behind Kentucky's Mitch Barnhart when he announced his retirement last September. Malcolm Turner took over Feb. 1, and Williams stayed on as a full-time law professor. He also was establishing a Sports, Law & Society program at Vanderbilt Law School. "David authored a remarkable legacy at Vanderbilt, one defined by blazing trails and championing the student-athlete," Turner said in the release. Williams was vice chancellor of student affairs and a tenured law professor, general counsel and university secretary in 2003 when chancellor Gordon Gee dissolved the Vanderbilt athletic department. Williams' job overseeing student affairs put him in charge of athletics, which he had worked in while at Ohio State. He shed some jobs in 2012 when he took the athletic director title. During his stay, Vanderbilt won four national championships — in baseball (2014), women's tennis (2015) and women's bowling (2007, 2018) — and enjoyed its most football success in nearly a century. The last bowl berth for the Commodores had been in 1982. Vanderbilt went to six bowl games during Williams' time, starting in 2008 and most recently in December. It marked a huge turnaround for a program that ended the SEC's longest bowl drought and a 25-year stretch without a winning record. Williams hired both James Franklin, now at Penn State, and current coach Derek Mason in football. Vanderbilt has five wins in the past seven years over intrastate rival Tennessee and just reached a second bowl in three seasons. Mason wrote on Twitter that he loved Williams and that his "wisdom and guidance forged a bond that will never be forgotten." Williams also hired Bryce Drew and Stephanie White in 2016 to coach men's and women's basketball, respectively, and he retained Tim Corbin as baseball coach. The Commodores' streak of 13 straight NCAA baseball tournament berths is best in the SEC, and they are the preseason pick to win the conference title this year. Williams also oversaw upgrades to the football program's McGugin Center — along with building an indoor football practice facility that also has a track — and other construction projects for the athletic department.